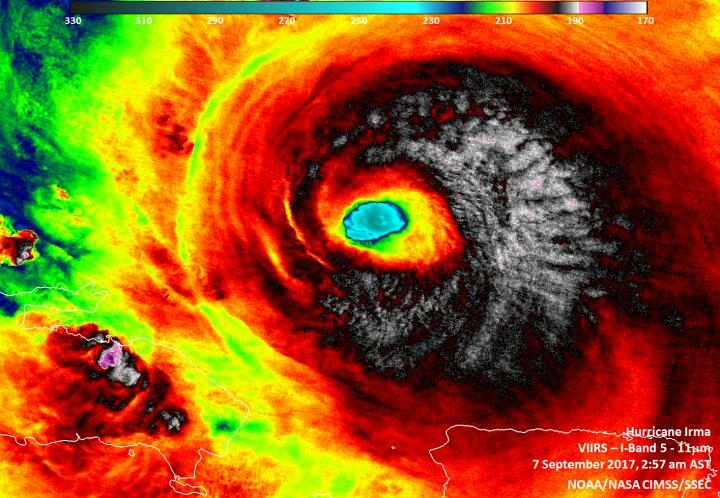 Infrared imagery from Suomi NPP revealed cloud top temperatures as cold as 190 kelvin (minus 83.1 degrees Celsius/minus 117.7 degrees Fahrenheit) from Irma's northern quadrant, stretching through the eastern side to the south of the eye. Those cloud top temperatures indicated the most powerful storms in Irma, stretching high into the troposphere. NASA research has shown that cloud top temperatures that cold can generate very heavy rain. For updated forecasts on Irma, visit: http://www.nhc.noaa.gov.